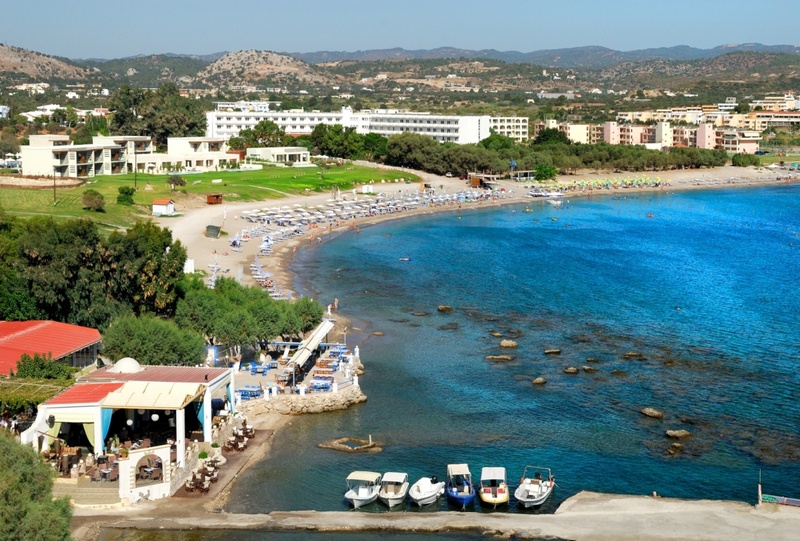 Kolimpia is located on the east side of Rodos island. Its position exactly halfway between Rodos and Lindos offers to those who live here, the opportunity to meander between these two cosmopolitan settlements of the island. Kolimpia was built by Italians as a model agricultural village and therefore is not among the traditional villages of the island. The coast is formed by two bays with beautiful beaches. Kolimpia is a quiet and friendly settlement, mainly tourist area with few luxurious hotels. Also, to the north of the village, you can visit the Holy Monastery of Paramithia (means fairy tale in Greek). The pebbled beach Kolymbia lies 24 km south of the town of Rodos, in a small cove. It has a lot of greenery that creates a quiet, yet modern resort. It's ideal for families with children or couples of all ages who prefer a nice beach, but without the bustling crowds of other well-known beaches of the island. And if you are a fishing enthusiast, here you will find an ideal place to catch large or small delicious fish. Food and drinks are available from the few restaurants and other shops that are located close to the sea. The entrance to the village is the spectacular route of Eucalyptus, which as the name suggests is a leafy street with tall eucalyptus. Another characteristic of the settlement is that almost all roads carry names from European capitals, such as London Street, Stockholm Street, Paris Street, Amsterdam Street and more. Find the street named after your own country! At the afternoon take a stroll in the street of Eucalyptus, to enjoy the scent of the tall trees that beautify both sides of the road. The Scout Centre of Rodos is also here, so make a visit! DO: Go to Kolimpia if you seek quietness in a friendly and luxurious environment. DON'T: Limited choices of entertainment. Find information about selected Hotels, apartments and rooms in Kolimpia to choose the perfect place for your accommodation.